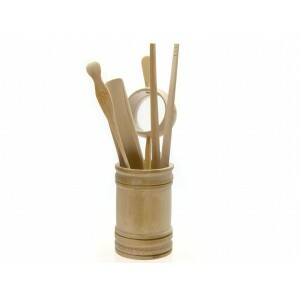 1pc Cha Tong(Bamboo Tube)-Diameter:58mm Height: 88mm-hold all utensils. 1pc Cha Ze(Teaspoon/Scoop)-Length: 168mm Width: 25mm-is used to collect tea leaves and place them into the teapot. 1pc Cha Jia(Tweezers)-Length: 190mm Width:10-12mm-is used to remove tea leaves from the tea pot and to hold the small heated tea cups when "washing" them with tea to avoid touching the inside with your fingers It will avoid burning your fingers with the scalding tea when pouring over the cup. 1pc Cha Lou(Tea Strainer/Filter): Length: 145mm Diameter: 55mm- use it upon a gongfu tea pitcher filtered out the tea leaves. 1pc Cha Zhen(Tea Needle): Length:182mm Width:15mm Tea Needle - is used to prevents spout blockage and place the tea leaves into the tea pot.